Oh short rows - you clever things! Creating 3d shapes from flat fabric. Cupping breasts and bottoms *ahem*, shaping shoulders, hugging backs, heels and necks, creating hats from flat. So useful, yet much misunderstood (and sworn at). We can't be having that and I am here to sing your praises and unravel your mysteries. Short Rows: What are they? Working short rows is a technique of working only part of a row or round to a set number of stitches, turning and working back a set number of stitches. This "set number of stitches" is determined by your pattern - sometimes it is part of the way, sometimes all the way to the end. You may work shorter and shorter rows initially, creating a piece that looks like a set of steps. However, in a short row section you will eventually work longer and longer "short rows" until the same number of stitches that was in your original row or round is worked. This builds up extra rows and therefore extra space where you may need a bit more room in your garment. The longer short rows naturally curve your piece, creating the 3d element to your work. Short rows are very common in knitting - at the bust, at the shoulders, at the back of the neck and hats are common places that you see them. They are, of course used in crochet, but not as frequently and there are some differences to how they work. Patterns all written differently, but there tend to be 2 common ways to explain short rows. 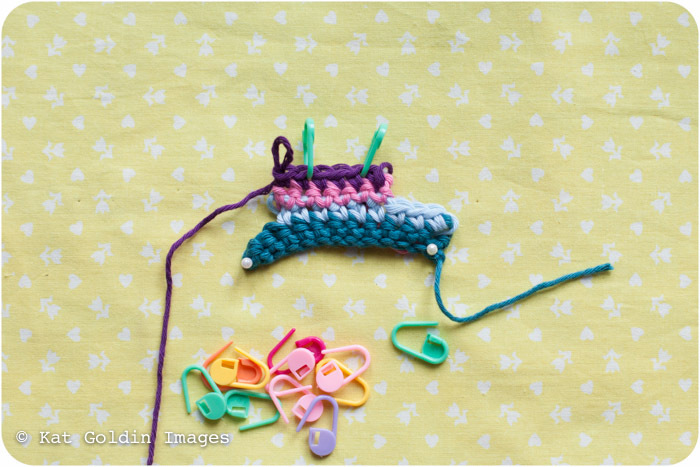 In one common way, stitch markers are used as a guide for what part of the row you will working. The other common short row technique will usually be written so that you work only part of the number of stitches in the row or rows, then eventually working longer and longer amounts until you are back to your original stitch count. The principle is the same in either way. Example 1: In the first example, I am going to create short rows by working one stitch past the stitch markers on each side. This creates a 3d shape where the extra rows would be in the middle of the work - something like this could be used for bust shaping or maybe a shoulder cap . I have changed colours each row to show you where the rows start and end. This is just an example, your pattern will tell you how many stitches to work in each short row. Row 2: 1ch, sc to 1 stitch past the second stitch marker. Row 3: 1ch, sc to one stitch past the second stitch marker. Row 4: 1ch, sc to 2 stitches past the second stitch marker. This is where it can get confusing, as people look at this and think they don't have enough stitches, but you are going to work the last stitch into that very first row (the teal row in our example). Row 5: 1ch, sc to 2 stitches past the second stitch marker. Continue working as above, working one more stitch past the second stitch marker on each row until all the stitches of the original row are worked. In this example, it is a total of 9 rows until all of the stitches are worked. You can see how the work is curved when pressed flat. But really comes into its own when seen in 3d. If you are working a series of longer rows to build up the shape, you may have quite a large gap to "jump" as your rows get progressively longer (the example below is 4 rows of stitches between the 2 stitches). In this case, it is a good idea to connect the rows in some way. For single crochet, I insert my hook into the turning chains of the rows I am "jumping" (there will be 1 t-ch for each 2 rows) and then into the stitch. I then yarn over hook and draw up a loop through the stitch and the 2 t-ch. Then yoh and pull through both loops. This creates a very secure and nearly invisible join. Alternatively, it may be that the short rows are just connected by one long row. In which case, the step tends to be very small. These is just an example. You can theoretcially use any stitch to make short rows (though see the tips below for some thoughts on choosing a stitch). The Aruacaria Cardigan uses short rows as well. Stitch markers are placed, and then short rows are worked starting at 2 angled crochet stitches after the stitch markers. After that, each row works one more angled crochet stitch of the first row, creating a really lovely shaped upper neck. The same technique is also used at the sleeve caps (I've posted a more in depth explanation of the short rows in Aruacaria on The Crochet Project blog). - When you are working a stitch into the original rows after working short rows, pull the first stitch tight to eliminate a bump or gap in the stitches. - There is no need for "wrap and turn" as in knitted short rows. However, gaps can still happen. Most stitches work well for short rows in crochet, but some taller stitches do tend to have slightly more noticeable joins. This isn't a problem, but making sure that first worked stitch after the short row is nice and tight can help alleviate that. Alternatively, you can connect the "longer" rows to the short rows, by working into a t-cho or a loop of the stitch as discussed in example 2. - As many crochet stitches do look different when worked in rounds versus rows, some forward planning is needed particularly if your piece is worked in rounds. Some stitches don't have noticeable front and backs, so it is not a problem. The other alternative is to work in rounds, but turn your work at each round throughout so that the stitch patterns match. - For a short row hat, you only work one edge of the wedge in short rows then work all the way down to the edge of the brim side of the hat. This kind of hat construction is also called sideways. You can tell the hat is made this way because of the characteristic pinwheel on the crown. Hint: this is a great technique for tunisian crochet hats. Anyone used short rows in crochet and have some top tips? Is there anything I have forgotten?